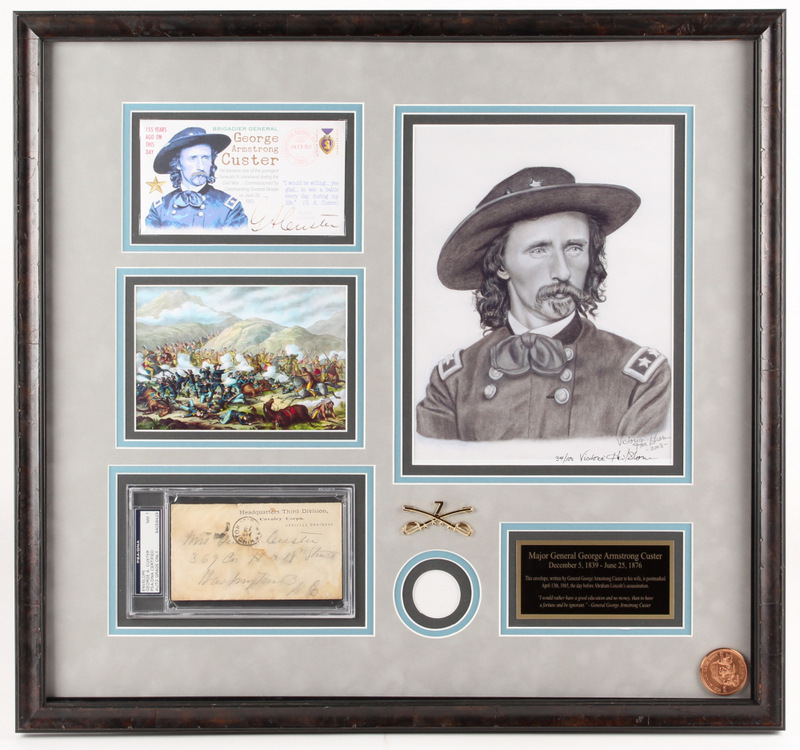 Custom frame measures approximately 22.75" x 24.25" in size and features an envelope that has been hand-signed in black ink pen by George Armstrong Custer (D. 1876). 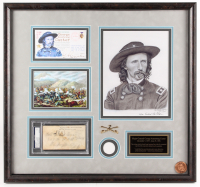 The display includes a limited edition Victoria Heilshorn print that has been hand-signed and hand-numbered #34/100, a second envelope with a facsimile autograph, a print of the Battle of Little Bighorn, as well as a Seventh Cavalry dollar coin. 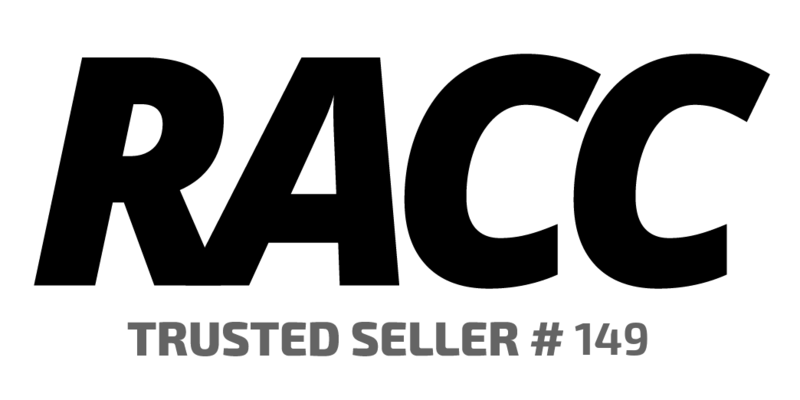 Please note, the coin has shifted during handling. This signed envelope is truly one of a kind. 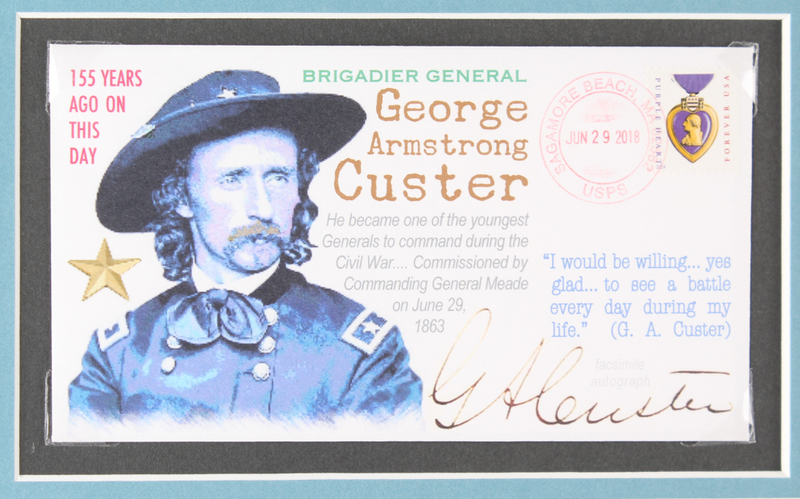 There are a few Custer signed envelopes on the market, as the most common way for his signature to appear was as part of the address, (Mrs. General Custer or Mrs. General GA Custer.) 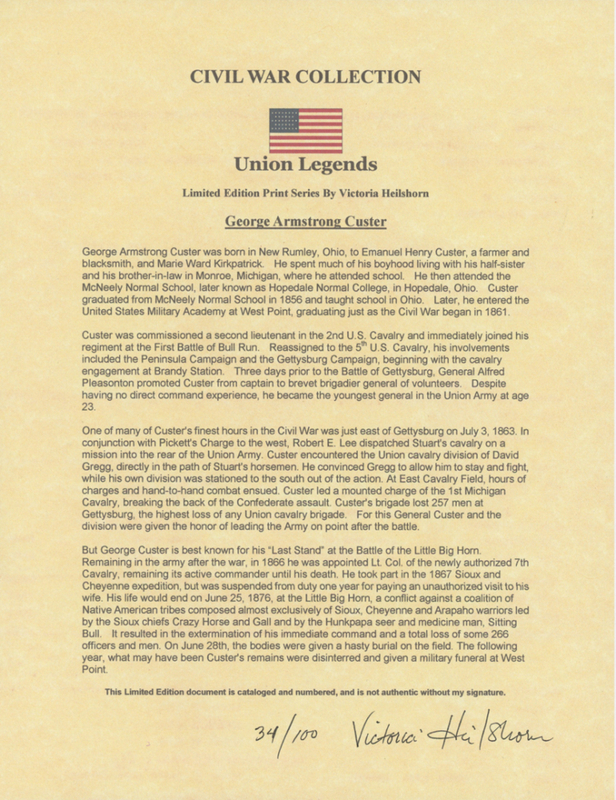 His wife lived for a time in Monroe, Michigan, many of the envelopes are addressed there. 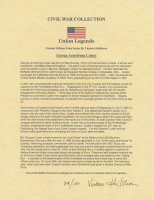 Some are addressed to western locations like Fort Riley, where Mrs. Custer was out near her husband's postings. The Custer's lived in Washington, D.C. near and after the end of the Civil War. 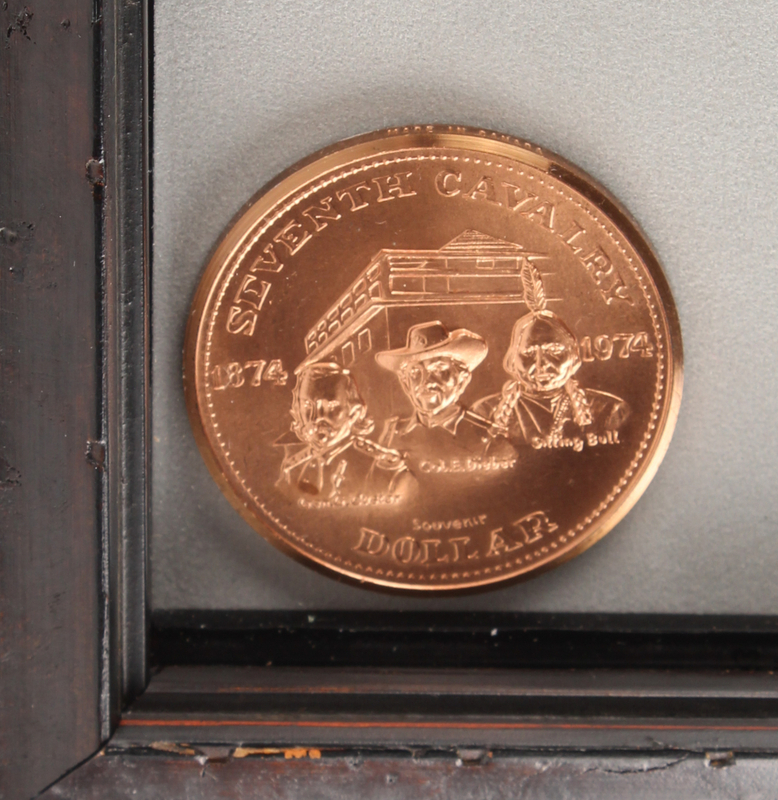 This particular envelope is addressed to their location in Washington, and more importantly, it is postmarked April 13th, 1865 the day before Abraham Lincoln's assassination. 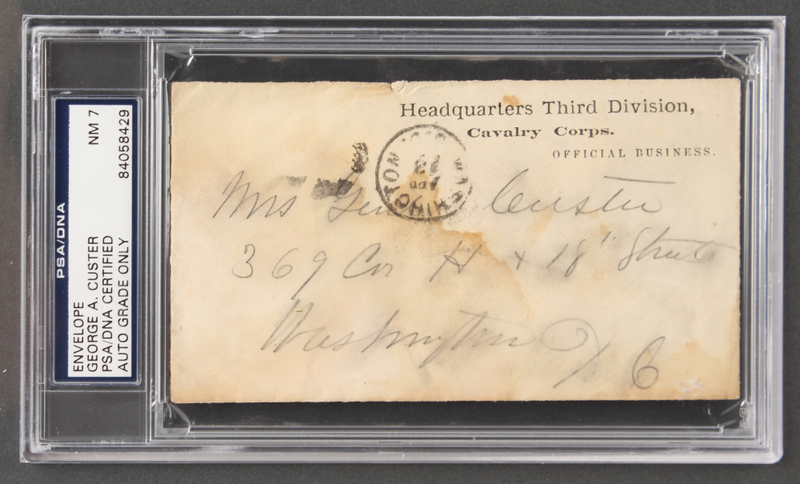 Newspapers and other paper materials with this date on it are extremely valuable let alone a General Custer signed envelope.